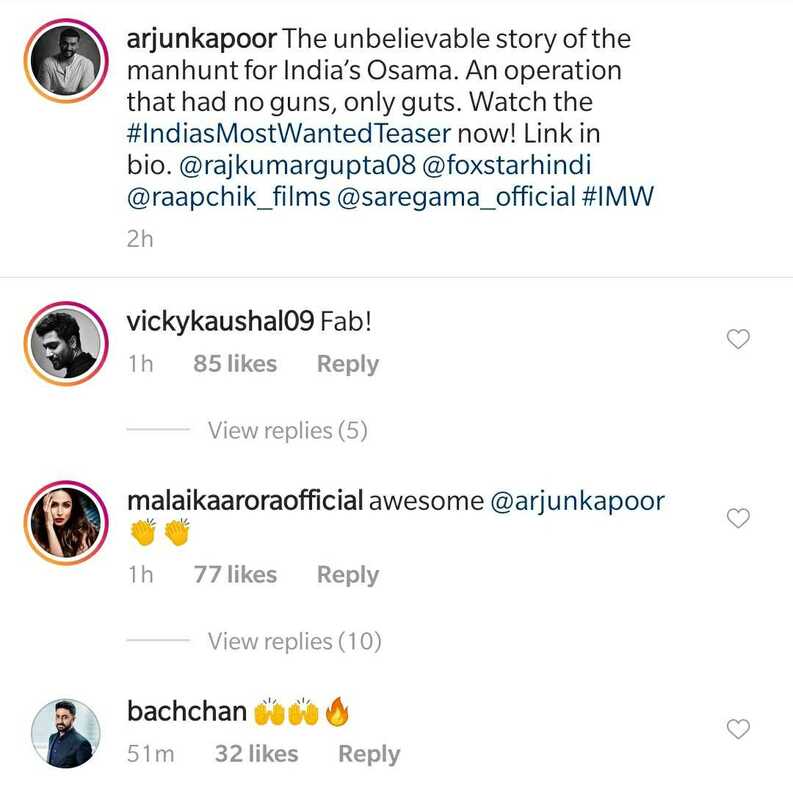 After the teaser of India's Most Wanted was released, many from the film industry took to social media to praise it. The teaser of India's Most Wanted, Arjun Kapoor's much-awaited film, was released today. The actor's fans showered it with praises, using words like 'impactful', 'amazing' and 'powerful' on Twitter. Many members of the film industry, including Kartik Aaryan, Varun Dhawan and Vicky Kaushal, too showed their appreciation in the comments. His rumoured girlfriend Malaika Arora was among those who cheered for the actor as he posted the teaser. She took to the comments section to call the teaser "awesome", alongwith two clap emojis. From attending fashion shows together to showing love for each other on social media, Arjun and Malaika haven’t shied away from making their relationship public. Although none of them have made their relationship official, they make headlines everyday. Rumours were swirling recently that they would be tying he knot in April. But the Bollywood diva said, "There is no truth to these silly speculations." That hasn't deterred more reports, though. These reports believe that the marriage rituals will take place between April 18 and April 22, according to Hindu as well as Christian traditions. The reports also suggested that the couple has asked their close friends, managers and teams to stay free during this period. Written and directed by Raj Kumar Gupta, India's Most Wanted will release on May 24. Inspired by true events, it follows the story of five men, who seek to capture a deadly extremist.